Nina Simone was one of the most distinctive, individual and complex musical personalities of the second half of the 20th century, her music starting out from the base of the classical music she aspired to perform and compose throughout her career, but which encompassed other influences and styles as she became a commercial performer, recording artist and later a political activist, so that she could never be clearly categorized as a jazz, pop, gospel, R&B, folk or any other genre of artist. She made her recording debut in 1958, and the next few years were among the most prolific of her career, encompassing both studio and ‘live’ recordings as she recorded first for the Bethlehem label and then for Colpix, marking her down as a pianist and singer who was a versatile and unique interpreter of songs from across the jazz, blues and pop spectrum. 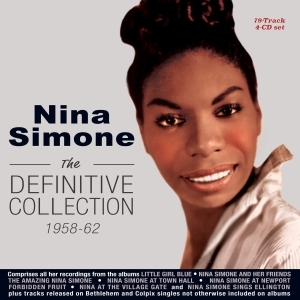 This great-value 78-track 4-CD set comprises just about every recording which she released during the formative years of her career and which established her reputation, featuring the tracks from the albums “Little Girl Blue”, “Nina Simone & her Friends”, “The Amazing Nina Simone”, “Nina Simone at Town Hall”, “Nina Simone at Newport”, “Forbidden Fruit”, “Nina at the Village Gate” and “Nina Simone Sings Ellington”. It also includes tracks released on singles which were not otherwise included on albums, naturally featuring the chart hits “I Loves You Porgy”, “Nobody Knows You When You’re Down And Out” and “Trouble In Mind”. It’s a comprehensive overview of the early career of a very special artist.